Chair Yoga books - SunLight Chair Yoga: yoga for everyone! Improve your energy, quality of sleep, strength & mental peace. 160 pages, 6" x 9" book in color and black and white editions with over 230 photos. Click here to look inside of the book! For wholesale orders to sell at your yoga studio or yoga classes email here. For Austrailia orders, additional quantities or combinations, email here. ebook on ibooks $9.99. 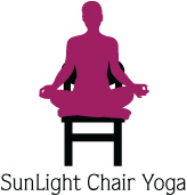 Click here: SunLight Chair Yoga: Yoga for Everyone! This Chair Yoga book is accessible (no charge) for the blind & print impaired in audio & braille. Donate a copy for your local library or assisted living home! Email here for your karma yoga order. Include the location name and where you want me to ship it to and the cost of the book (color or black & white) in your order. SunLight Chair Yoga book was a featured resource in Alzheimer's Prevention and Research Foundation's and LymeDisease.org. Books and Books booth at Florida Yoga Journal LIVE! 100 pgs, Published 2012. Out of print.